The concept of consumer surplus in measuring the benefits of rural electrification continues to be misunderstood by many people. In this posting, I try to address some of those misperceptions. The main point is that consumer surplus is really a shortcut way to measure social and economic benefits. People purchase kerosene to use in lamps, and then in turn use the light from those lamps for various activities they want to do. Likewise, households purchase electricity to produce light, and this permits an even wider variety of evening activities in the households. People know that electric lights over the short and long term might result in increased education, improved productivity, better ability to host social gatherings and other benefits. The slightly modified quote below is from Chapter 9 of Electric Power for Rural Growth, and it discusses the evolution of the way benefits of rural electrification have been measured over the years. "The method for measuring the socioeconomic benefits of electricity has changed over the last 40 to 50 years, in part reflecting the new business environment. Forty or fifty years ago, the main benefits of rural electrification were measured as (electricity distribution company) revenue plus household avoided costs of using alternative fuels. The justification for using household revenues as rural electrification benefits was that this represented a minimum willingness to pay for electricity. The reasoning was that people who buy electricity perceive its value and make a decision to purchase electricity service. Therefore, the benefit must be, at a minimum, equal to what they pay for the service. Added to this were avoided costs of using other fuels, including those of diesel fuel for lighting, irrigation or motive power. Such approaches proved to be quite conservative ways of measuring the benefits of rural electrification because they underestimated the value of electricity for a variety of reasons. For instance, prices were often heavily subsidized and consumers might have been willing to pay much more than asked by politically influenced electricity companies. During the 1990s, the willingness-to-pay methodology evolved to include consumer surplus, a relatively simple yet often misunderstood concept. Consumer surplus is the difference between what consumers are willing to pay for kerosene or electricity and what they actually pay. For instance, an electricity company may charge a price of 10 cents per kilowatt-hour, but a consumer who values that electricity at a much higher rate reaps a consumer surplus because they are moving vrom a more expensive fuel (kerosene) to a less expansive one (electricity). During the 1980s, this idea was first applied to the demand for kilowatt-hours (Anderson 1975; Webb and Pearce 1985). This was an improvement over the use of revenues as benefits because it took into consideration consumer valuation of the benefits of electricity based on their demand. The drawback was that consumers were not actually demanding kilowatt-hours, but the activities made possible by electricity through the use of such appliances as electric lamps and machines. The next step was to apply the method of consumer surplus to value the actual end uses of electricity. When households first adopt electricity, they use it for lighting, replacing most of their kerosene lamps. Because electric lighting is of a higher quality and much cheaper than the light produced by a kerosene lamp, households can consume more light at a lower price. 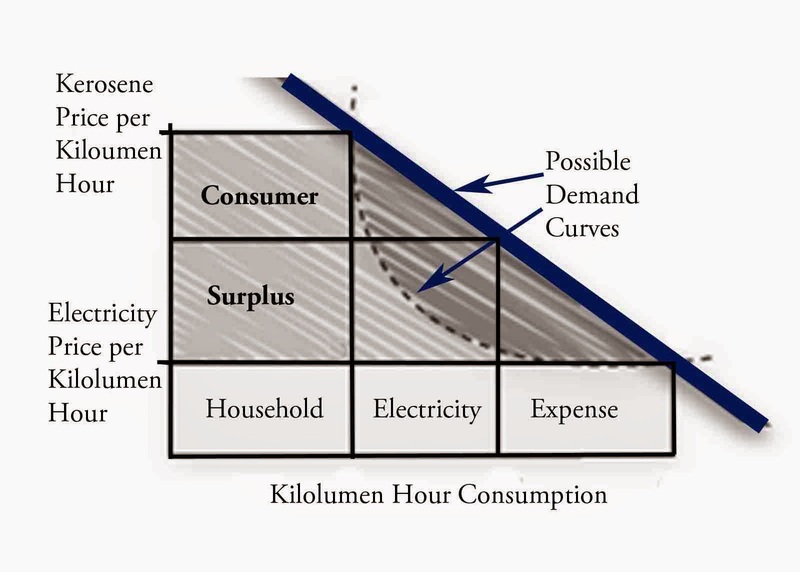 The result is that consumers gain the value of additional lighting by adopting electricity (figure 1, area under demand curve that is shaded light and dark). A reason consumers often give for wanting more light is so that their children can study at night, which they perceive as a long-term benefit for the family. Women can cook meals more efficiently due to having light in the evening. These are the actual benefit measures, while consumer surplus for household lighting is a shortcut for indirectly measuring such benefits. As mentioned above, consumer-surplus methods for measuring benefits are often misunderstood. Those unfamiliar with the underlying theory sometimes think it is a measurement between two price-consumption points—one for electricity and one for kerosene lighting. This is wrong because those price-consumption points must be based on representative surveys that measure actual consumer demand for lighting at certain prices; that is, a survey is needed that can define a demand curve. Thus, the two points actually lie on a demand curve for household lighting, and it is the area under the demand curve for lighting that represents the value of benefit to consumers." This excerpt from Electric Power for Rural Growth uses a figure from a four page ESMAP study that indicated how to precisely calculate the consumer surplus for lighting. Most of this work was also developed and published in a 2002 study on the benefits of rural electrification in the Philippines.